Top 5 reasons to get a winter pedicure: Your freezing feet will thank you! “Nobody seems my toenails in the winter,” is no excuse to let your foot care go during the cold months according to Lindsay Crow, a licensed cosmetologist and esthetician at East Village Spa. Lindsay strongly believes that foot and nail care is a year round health necessity. She shared her top 5 reasons to take care of your tootsies with a safe, professional pedicure this winter. 1. Cuticle and nail oil is a must for cold, dry weather. Natural oils like shea butter, avocado, and jojoba are the best types to use for hydrating nails and cuticles to prevent small cracks and openings in the nail which can lead to infections, hang nails, and ingrowns. These oils also strengthen the natural nail. We think about cuticle oils on our hands, but we forget about them for our feet. 2. A winter pedi is a perfect chance to treat your nails while taking a break from polish. It is ok to be bare! Nails are made of a tough protective protein called keratin. Nails do not breathe, but putting polish onregularly without a break can lock in and trap bacteria, fungus, yeast, mold, and mildes that can form under the nail plate. Podiatrist Erin Nelson from Des Moines University taught our team during a recent training that if you have unwanted growths, polish could trap them in, speeding along their progression. It is also good to take a polish break before a visit to your physician, podiatrist, or dermatologist so they can inspect nails for fungus, ingrowns, and melanoma. We can always buff your natural nails to a shine if you are willing to take the bare nail plunge! 3. Professional, safe nail trimming and filing helps prevent ingrowns, excessive skin overgrowth, and helps keep nails from catching onto those fuzzy socks and tearing. A licensed nail care professional can help teach you the best way to clip and file nails and can help identify concerns that might warrant a visit to the podiatrist. 4. A pedicure is a great opportunity for extra TLC to clean the unwanted dirt and debris that easily gets caught under toenails and between toes. People can also experience issues if they don’t properly dry between their toes, especially before putting on socks. For some people, especially guests with injuries, who are pregnant or aging, it is hard or impossible to reach your own toes! Our nail technicians take care of that while you relax. 5. A pedicure can be a time to relax and recharge your batteries. Enjoy a cup of hot tea, get an amazing foot massage, and do something that is good for your physical AND mental health. Click here to book a pedicure with Lindsay or any of our great nail technicians this winter. Not ready to go bare but want a polish that dries immediately? Book a Shellac pedicure and you’ll be ready to put on your boots before you go. I’m writing a 7 part series on my European Spa Tour with a group of midwestern massage therapists. Start from the beginning here! Munich was an awesome city and I can’t wait to go back. By the time we got to Munich, I was in quite a bit of pain from travel and I needed a day off of dizzying public transportation (I have major vertigo issues). 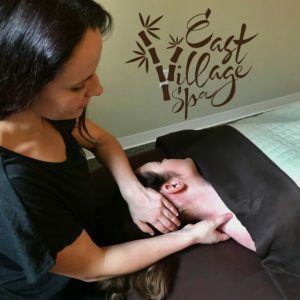 While the rest of the group took a day trip to a cool castle, my husband and I decided to find a small spa or clinic within walking distance for a really good massage. Clockwise from left: Sumitra, a Thai massage therapist, esthetician, and spa owner with Cassie (me! ), The most amazing tea made daily at Sumitra Spa with fresh ingredients, one of the massage rooms at the spa, and my foot soak with fresh flower petals. We found exactly that at Sumitra Spa after reading online reviews. While it might seem odd to go to a Thai Spa in Munich while I’m supposed to be on a trip to get a European massage experience, Thai spas were everywhere and my body was needing a more aggressive approach at this point in the trip! We got to the spa shortly after they opened to see about making an appointment and Sumitra, the owner greeted us and was able schedule us right away. One of her employees brought out a delicious homemade hot tea for me to enjoy while I waited (lemongrass, pandan leaves, ginger, and brown sugar), then brought out a foot bath with rose petals and oil to do a much appreciated foot soak and cleanse. I opted for the oil massage instead of the traditional floor Thai massage and I can honestly say that my massage was one of the best I’ve ever had. Some of the techniques were borderline “out-of-scope” for an American LMT (some incidental spinal manipulations…but I wasn’t complaining) and the draping was more sparse than I would offer a client in Iowa, but it didn’t feel inappropriate at all. I felt like a new human after my massage. 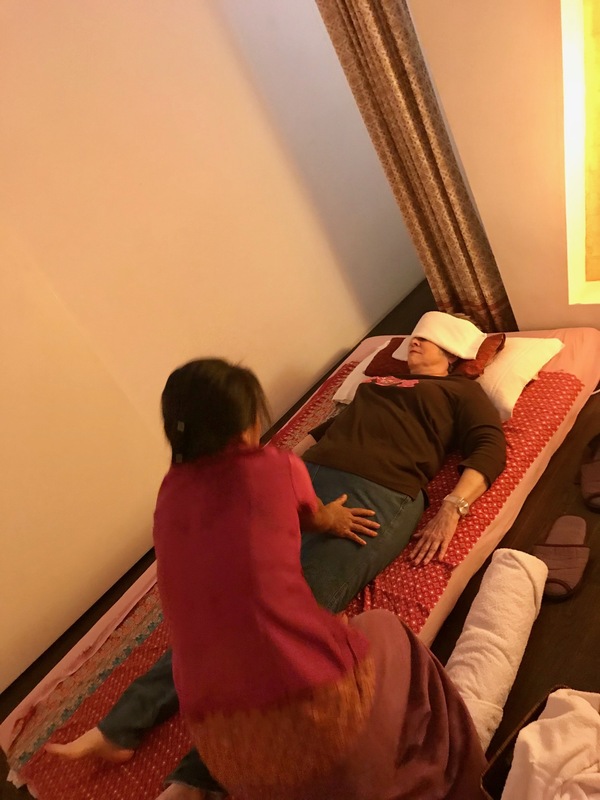 The highlight of the experience was sitting and chatting with Sumitra about our experiences as women business owners while my husband enjoyed his massage. She trained in Thailand and is proud of her experience and that of her employees, who are all from Thailand. She is 44 (but doesn’t look it!) 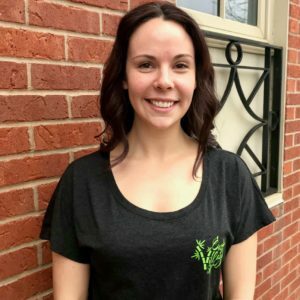 and has been a massage therapist for 7 years and spa owner for 6. She works long hours but loves her work. Sumitra also employs 4 other Thai therapists. Sumitra returns to Thailand yearly for continuing education on specific treatments, for example, Thai Massage for rotator cuff injuries and brings the information back to her staff. She has also incorporated Thai techniques into facial services and she’s proud of her unique methods. We talked about insurance and licensing and her clients pay out-of-pocket. The government insurance (and most private insurance) would not cover the style of massage they provide. She said “I know what my hands can do. My hands are better than medicine. Many people come to see us before getting surgery and we can often help.” Her business stays very busy and she has many clients, with about 50% local regulars and 50% tourists. While we chatted, I noticed a group of male tourists standing at the door, hitting each other in the ribs and pointing in at us. From 12 years in the industry, I knew exactly what was about to happen. They walked into the spa and into our little tea party. Sumitra got up to greet them and immediately they told her she was beautiful and asked for sexual services. She firmly stated that they do not do that, they offer Thai massage. They were upset and left. I asked how often that happens and she said that maybe only 2% of the time, but that for the most part people are wonderful. It was unfortunate, but we shared a knowing look and got right back to our chat. 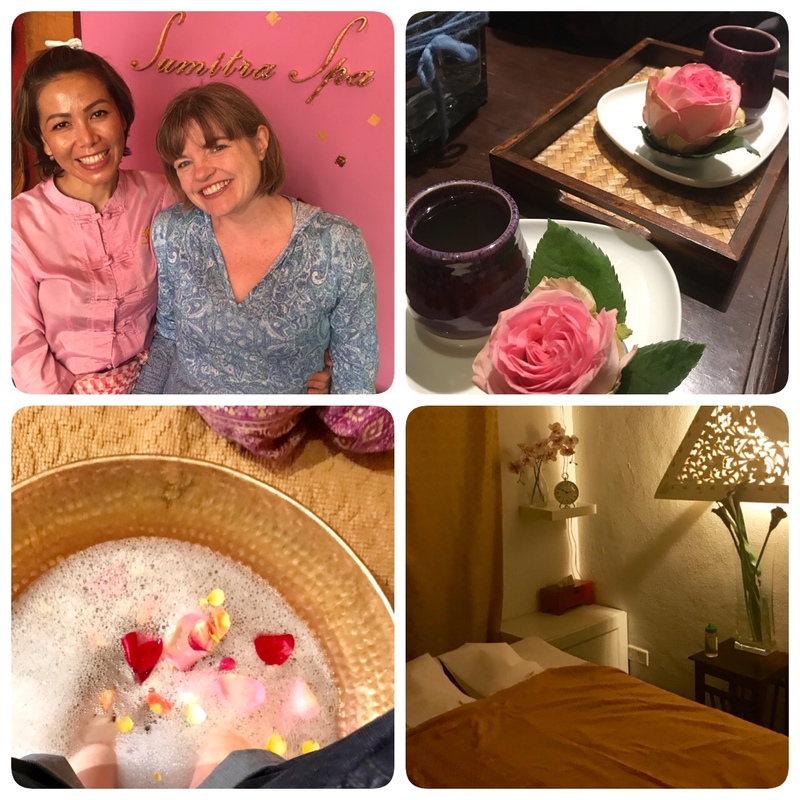 Sumitra’s spa was such a highlight of the trip that I brought one of my new massage therapist friends back the next day to try traditional Thai foot massage on the floor mats. It was just as wonderful as I’d expected and we were greeted like family by our therapists. If you find yourself in Munich, do yourself a favor and visit Sumitra and her team. One of my midwest massage therapist traveling buddies enjoying a traditional Thai foot massage on the floor mat at Sumitra Spa.